This wasn't quite my first in-person autograph of a hockey player, but it was my first autographed puck. 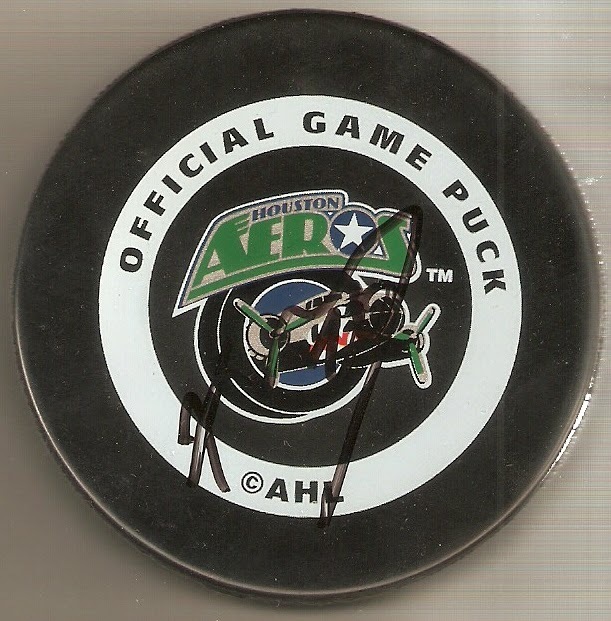 This hockey puck is an unused official game puck of the Houston Aeros autographed by Kyle Wanvig. I got the puck at a Houston Aeros game about 15 years ago, when Wanvig was signing autographs after the game's conclusion. Wanvig spent parts of four seasons in the NHL with the Minnesota Wild and Tampa Bay Lightning, with his most significant season coming in 2005-06, where he spent the entire season with the Minnesota Wild, scoring four goals and eight assists in 51 games. His last game in the NHL came during the 2007-08 season, and he spent the next few years bouncing around the AHL and a couple European leagues, before announcing his retirement in 2011.